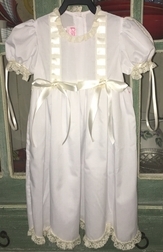 A lovely heirloom dress for girls in your choice of color batiste with a beautiful bodice embellished with wide satin ribbon woven through "tunnels" and ending near the bodice and skirt seam in big pretty bows. 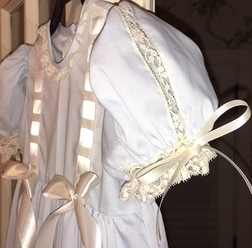 The neck, sleeves, seam, and hem of the dress are trimmed in French lace. 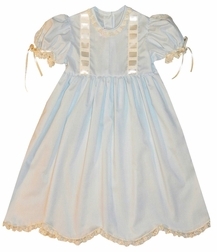 The sleeves are also made with smaller satin ribbon through beading that form pretty bows with long tails. The bottom of the dress is made with a scalloped hem. 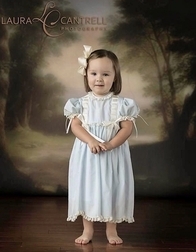 The dress looks lovely with a monogram in the center of the bodice. Because batiste fabric is more sheer than other fabrics, we recommend use of our heirloom slip with this dress.